I can’t say I’ve done reviews on every NAS unit out there, but I’ve had my fair share of experiences with them. 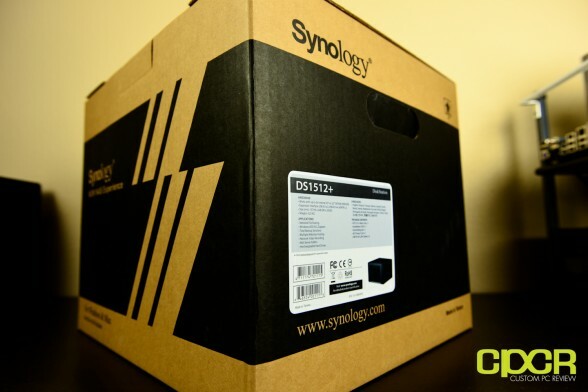 Previously, we’ve taken a look at the home oriented 2 bay Synology DS212, which is a great home oriented NAS unit perfect for those home users who need a storage unit with some sort of redundancy built in. Then, we took a look at the SOHO oriented 4 bay Qnap TS-419P II, which was a fantastic, well priced NAS unit with plenty of features designed for those who want more versatile redundancy options offered with a 4 bay NAS unit such as RAID 5 or RAID 10. 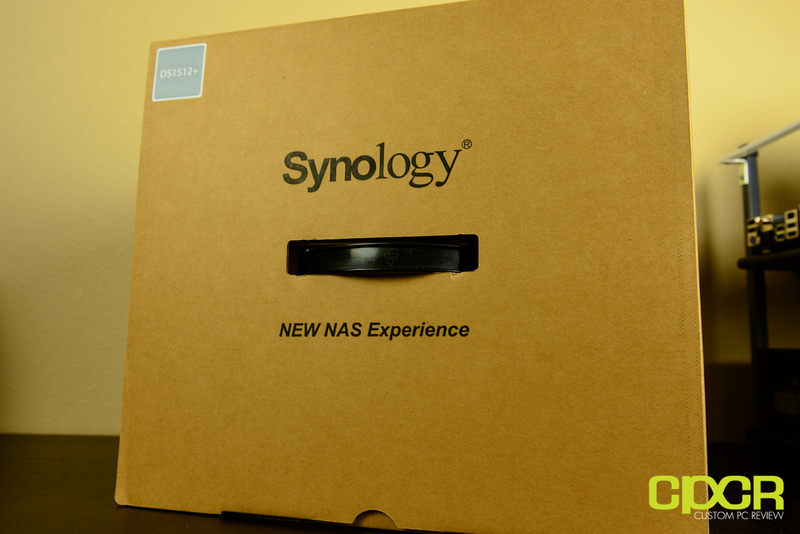 Naturally then, today we’re going to review something a bit more advanced – the Synology DiskStation DS1512+ NAS unit designed for small to medium sized business. What makes this one so different from ones designed for home or small office use? Well, we’re going to get a couple things such as a faster processor, more memory, more hard drive bays, and more expandabiilty options just in case what we’ve got here isn’t quite enough. Taking a look at the specifications page for the DiskStation DS1512+, Synology gives us a pretty vague description of the CPU as it just says Dual Core 2.13GHz. That said, what’s actually inside is an Intel Atom D2700 x86 processor, and a quick peek at its product page on Intel’s website reveals that it’s a dual core, hyperthreaded processor, so it’ll also support a maximum of four threads. 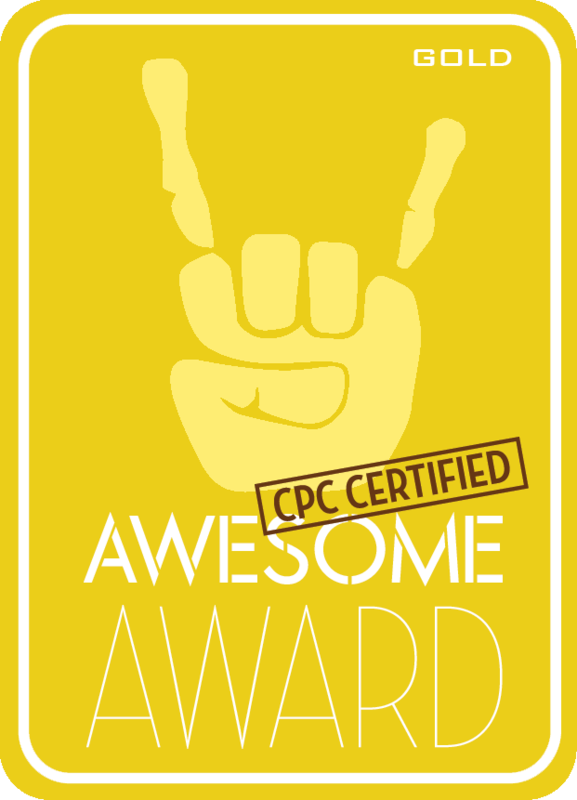 Additionally, it’s also got a max TDP of only a mere 10w, which is extremely power efficient. In comparison, ULV (Ultra Low Voltage) Sandy Bridge and Ivy Bridge processors are rated at around 17w TDP, nearly double that of the Atom. 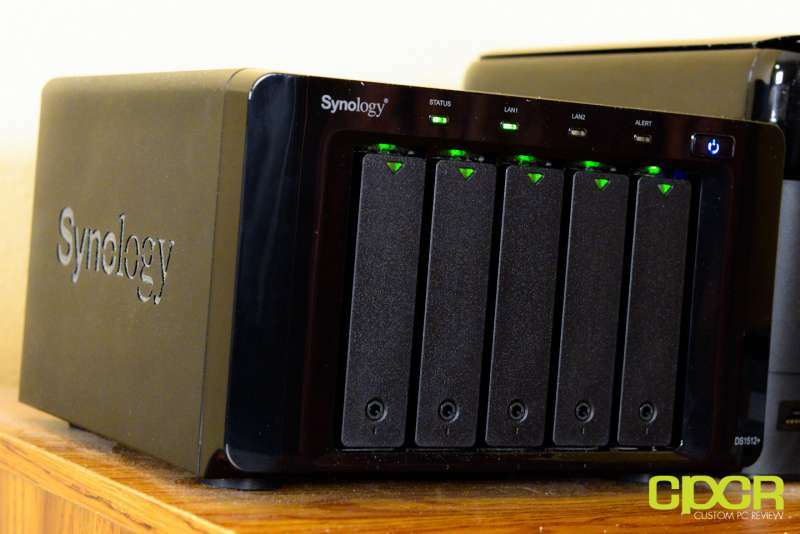 Additionally according to the specifications, Synology has pre-included a massive 1GB of memory, which should be plenty for most users, but it can be increased up to 3GB for those running heavy databases and web applications. Looking at the design of the DS1512+, it’s actually quite similar in appearance to what we saw from the DS212 which was reviewed previously. This is actually a fantastic design choice as the entire unit looks extremely professional – perfect for the home or the office. The the materials used in the DS1512+ also feels significantly more durable than its home use oriented cousin, the DS212. Similar to the DS212, the bezel is made of a pretty heavy-duty glossy plastic material while the drive trays themselves are made of some heavy-duty plastic. There’s also a drive locking mechanism at the bottom of each tray that can be locked using the included key. Up top, there’s four status LEDs (STATUS, LAN1, LAN2, and ALERT) along with a logo to the left and a power button to the right. At the bottom right, there’s also a DS1512+ logo. The unit itself measures 233mm long, 248mm wide, and 157mm tall, and weighs nearly 10lbs when empty. This is no doubt due to higher quality construction materials along with the fact that the unit is practically a full on x86 PC, coming with a full dual core 2.13GHz Atom D2700 x86 processor and 1GB of onboard memory. Drop in five more 3.5″ hard drives and you’ll have a pretty hefty unit, no doubt. 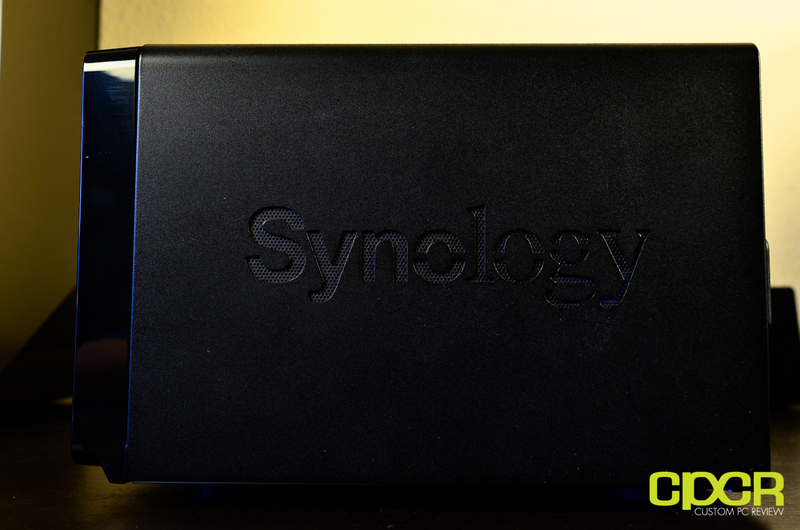 On both sides of the casing, there’s a Synology logo engraved. Additionally, the casing on the DS1512+ is completely made of a metallic material which feels extremely sturdy. Each hard drive tray may be ejected by pushing on the bottom portion of the tray. The tray slides very easily in and out of the unit and the drives fit in quite securely as well. 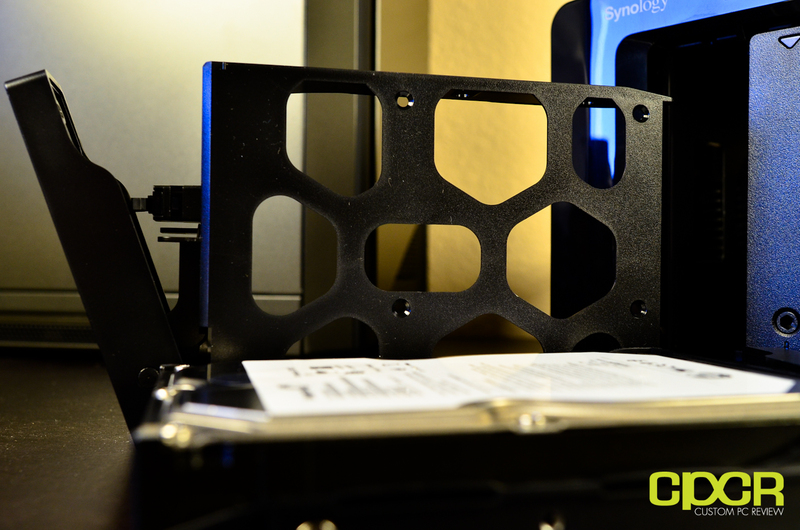 Each hard drive may be mounted to each tray via mounting holes running along the sides of the tray. What’s interesting is that Synology is using plastic for their trays instead of metal found in other NAS units such as the QNAP TS419P II. However, as you’ll see in the next picture below, the plastic is extremely thick and feels extremely high quality. At the bottom of the hard drive tray, there are also mounting points for 2.5″ drives as well for those using 2.5″ notebook drives or SSDs. 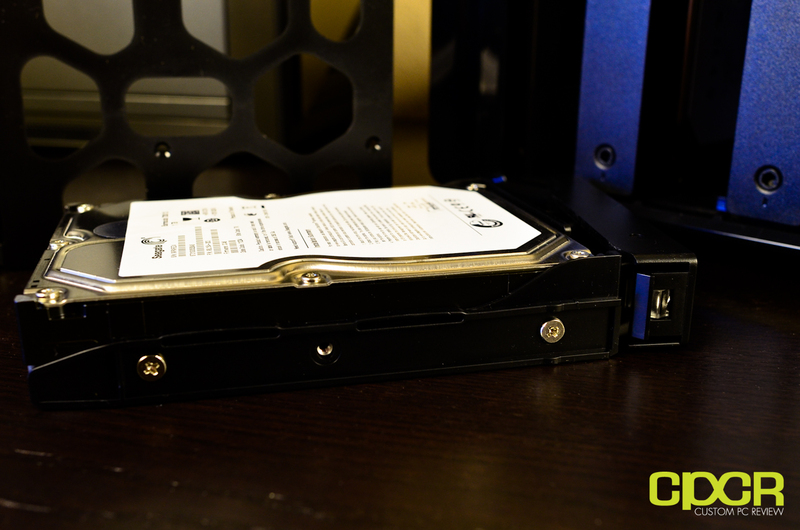 Here we’ve got a shot of the rear SATA ports which connect to the hard drives as they’re inserted. 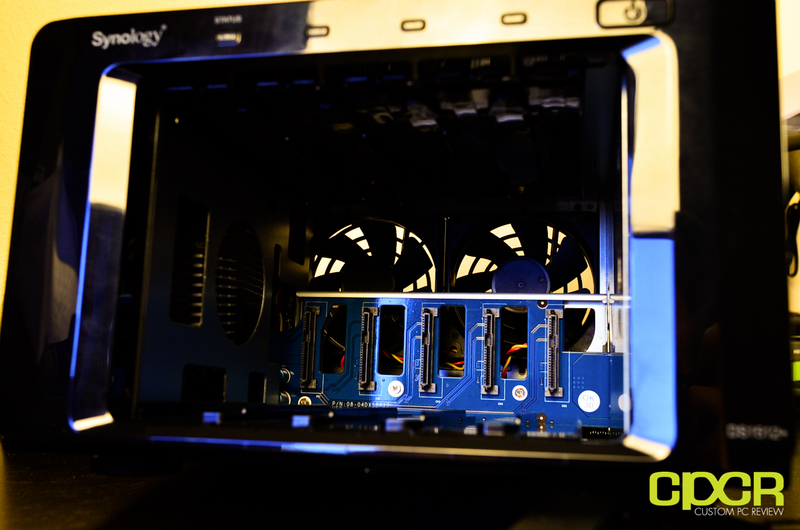 Additionally, the unit has dual 80mm fans for cooling the drives inside. Back here, we’re greeted with a ton of stuff. Starting from the left, we’ve got the power connector, which connects to an internal power supply of an external one as seen on the DS212. We also have 2x 80mm fans (user replaceable), 2x eSATA ports, 2x USB 3.0 ports, 2x ethernet LAN ports, and 4x USB 2.0 ports. Similarly to what we saw in the QNAP TS419P-II, the DiskStation DS1512+ has dual gigabit LAN ports, which means it’ll be able to use those LAN ports for purposes such as failover, link aggregation, or even connect to different networks. Because of this, the DS1512+ is advertised to support a maximum transfer rate of 194.6MB/s writes and 192.4MB/s reads; however, this will only be achieved when multiple connections are made as Gigabit ethernet only supports a maximum throughput of roughly around 125MB/s depending on networking hardware. 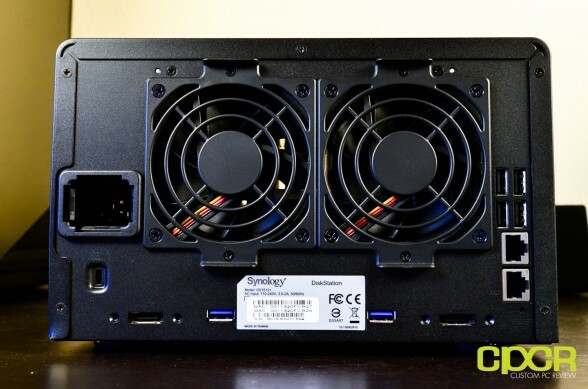 Another interesting piece of the DS1512+ is the dual eSATA ports on the back, which will allow it to connect to the Synology DX510 5 bay Expansion Unit. This means that if you find yourself needing more than a 5 bay NAS unit, you can always purchase one of these DX510’s for another 5 bays. Two eSATA ports means an extra two DX510 units can be connected for a total of 10 additional drive bays. 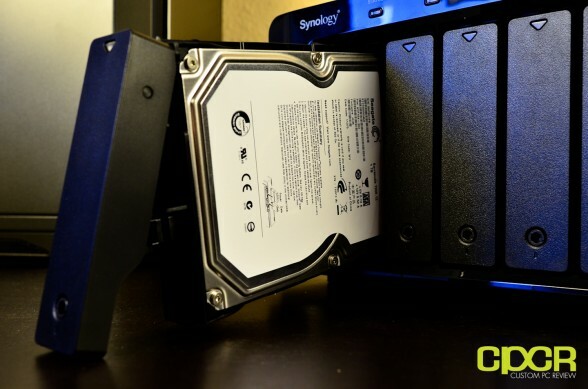 If 15x 4TB drives are used, you’d be looking at a total of 60TB of storage space. The DS1512+ also has a ‘fan fail over’ or ‘System Fan Redundancy’. This means if one fan fails, the other will speed up and compensate for the failed fan. DSM will give the user a notification about the fan failed and he can get immediately get in touch with our support. In return, there will hardly be any downtime for the user. 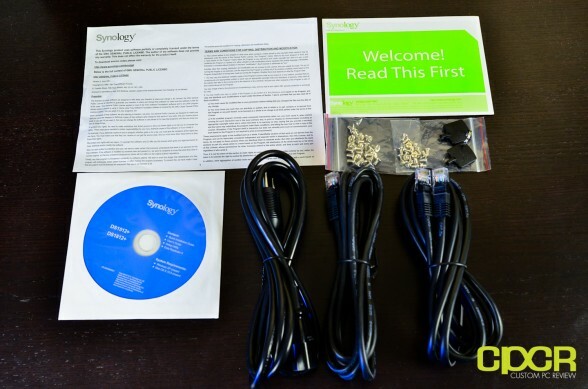 Additionally included with the DiskStation DS1512+ is some documentation, a utilities CD, mounting hardware, a locking key, two LAN cables, and a power cable. The nice thing about Synology DiskStation NAS units is that pretty much every unit has support for DSM 4.0, which is Synology’s newest operating system for driving their DiskStation NAS units. 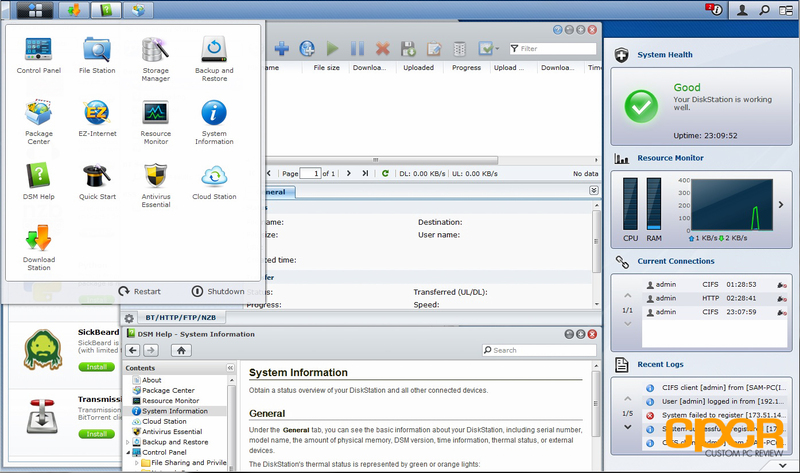 As you can see from the screenshot above, Synology’s DSM 4.0 software offers an easy to use GUI (Graphical User Interface) that’s very similar to most of the common operating systems out there such as Windows or Linux. A comprehensive help file is included for those having trouble starting, but everything should be quite self-explanatory. Feel free to check out our review of the DiskStation DS212 for more information on DSM 4.0. Additionally, Synology offers a demo on their website for those interested in a hands on as well. With the review of the DS212 we showed you some of the features in the DSM 4.0 software so this time around we’ll show you a couple more. In the top left, we have the FTP server setup, which makes it easy for users to store and retrieve files from the server through the internet. At the bottom left, we’ve got the Storage Manager which tells us the status of each disk installed, the type of RAID configuration that’s setup, temperatures, and all that good stuff. To the right, we’ve got the list of packages (or applications) that may easily be downloaded and installed through a single click. One cool thing about the DSM 4.0 software is that you may opt to download open source packages from a third-party repository such as Synocommunity. As you can see, a lot more open source, 3rd party software may be loaded onto the NAS unit. Finally, here’s another piece of software I find myself using quite often – Data Replicator 3. 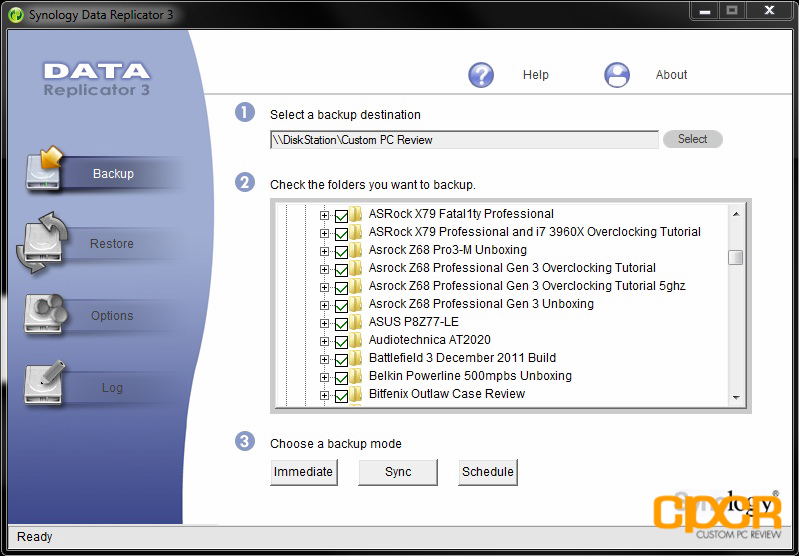 Those needing to back up files on a regular basis may use Data Replicator 3 to automatically make multiple backups (versioned) to the DiskStation. This is a very easy way to choose specifically what files need to be backed up and how many versions of these files should be backed up. Those of us who’ve been using computers for a while know that when it comes to hard drive failure, it’s not an if, it’s a when, and you’ll definitely be glad to have backups when that failure does happen. 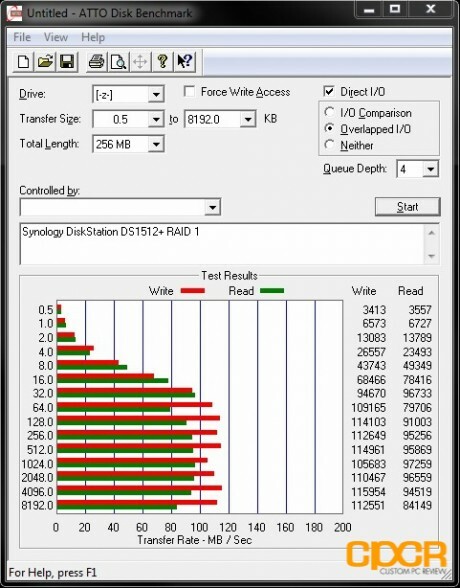 For performance testing, we’ll be using ATTO Disk Benchmark and testing DS1512+ in different RAID configurations over our Gigabit LAN network. We’ll be using 5x Seagate Barracuda 7200RPM 1TB hard drives for testing. In the performance department, the DS1512+ was as expected – fast. In our testing, any combination of RAID or even JBOD on the DS1512+ performed very well, hitting about 120MB/s writes and 100MB/s reads respectively. Between the DS212 and the DS1512+, we can see that there’s a clear performance advantage going with the DS1512+ as it’s able to get around 40MB/s – 60MB/s faster writes and 20MB/s – 30MB/s faster reads. This is most likely due to the faster CPU and the larger amount of available memory on the DS1512+. Having been previously very impressed with the DSM 4.0 operating system on the DS212, I was equally impressed with the DSM 4.0 software on the DS1512+ as well, which just so happens to be the exact same thing. Yes, you’ll be able to do everything the DS1512+ can do with the DS211 (and vice versa). This means access to the easy to use, easy to navigate DSM 4.0 GUI and easy access to different server options as well. 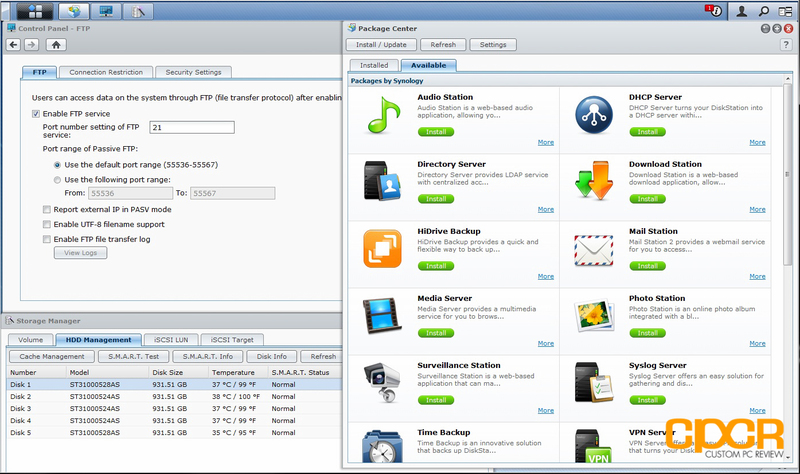 Those interested in learning a little more about the DSM 4.0 operating system, please check out Synology’s website here. Now usually I don’t pay too much attention to user reviews, but one thing I do have to mention here is that the DS1512+ did get some seriously bad reviews regarding what many of the reviewers called the “Blue Blink of Death, or BBOD”. Most if not all of these reviews occurred about two months ago and while I can’t be 100% certain that this issue no longer exists (as I’ve only had the unit for about a month), I did my best to reproduce the issue. It didn’t happen. So, to my knowledge this issue no longer exists as of DSM version 4.0-2228. Additionally, the BBOD issue seems to be an issue that Synology has recognized to affect a small batch of DiskStations and is currently resolved at this time. 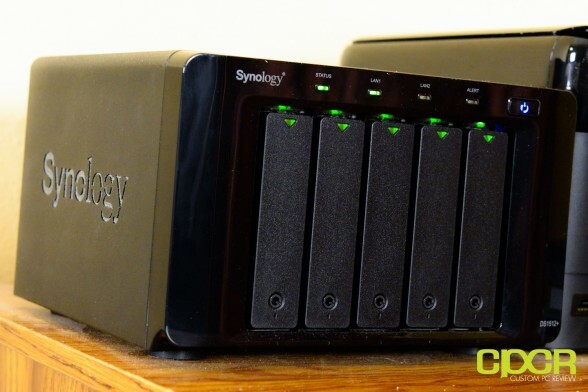 More information about this issue is available at Synology’s website. Moving on into the hardware side of things, the DiskStation DS1512+ definitely packs a punch here offering a 2.13GHz Dual Core Hyper-threading enabled Intel Atom x86 processor along with 1GB of memory (expandable to 3GB), making the DiskStation DS1512+ one of the fastest dedicated NAS units on the market. This means that it’ll be great for any type of usage scenario whether it be something for a medium to large-sized business, something for your home, or even a little bit of both. Speaking of home usage, the design of the DS1512+ is pretty universal too. Whereas some NAS units have industrial looking designs that don’t fit too well with home office decor, this isn’t really a problem with the DS1512+. The DiskStation DS1512+ isn’t short on connectivity options either. Featuring six USB ports, 2 of them USB 3.0 and four of them USB 2.0, the DS1512+ is definitely equipped to handle tons of expandability. Add on top of that two eSATA ports that’ll work with two 5 bay DX510 expansion units and you’ve got a NAS unit that’ll last years to come. That said, I would definitely like to see some front connectivity options. After having become so accustomed to backing up SD cards and USB memory sticks on the DS212 right through the front, it actually ended up being quite a hassle to have to go around to the back every time I wanted something backed up quick. Additionally, similar to what we’ve seen on the QNAP TS419P-II NAS unit, the DiskStation DS1512+ also includes dual gigabit LAN ports as well. This is a great feature especially for businesses who have multiple LAN connections, multiple internet connections, or simply just want to aggregate the two LAN connections to simultaneously serve as many users as humanly possible. With an advertised max speed of 200.31MB/s, 20 simultaneous users on the same network downloading the same file from the DS1512+ will still theoretically be getting approximately 10MB/s when using the Link Aggregation feature. Ok, so how about the pricing here? Well, taking a quick look over at Amazon, the DiskStation DS1512+ is currently going for a whopping $799.99, so it’s definitely not cheap. Competitors include the Drobo FS 5 Bay NAS and the Thecus N5500 5 Bay NAS. That said, Synology does have the best UI I’ve seen on a NAS unit so far and the DS1512+ has been performing like a champ for nearly a month now. After all the RAID configuration changes, all the testing, and all the abuse I’ve literally put it though (Yeah, I’ve even pulled drives out mid file transfer in RAID 5 mode), I still have yet to experience any data loss. The Synology DiskStation DS1512+ is an excellent, rock solid NAS unit, capable of delivering top end performance in any RAID configuration. Home users or business professionals looking for a powerful server that can do it all, but don’t want to deal with the time, effort, and costs associated with the administration of a full on Windows or Linux server will appreciate what the Synology DS1512+ has to offer. 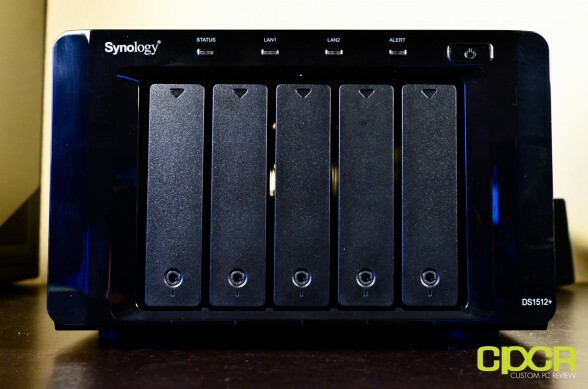 Special thanks to Synology for making this review possible! 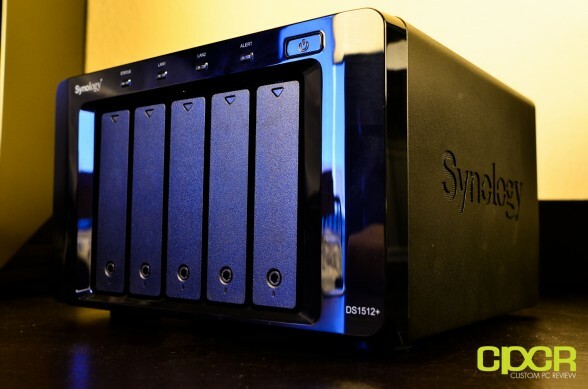 The Synology DiskStation DS1512+ is currently available on Amazon.